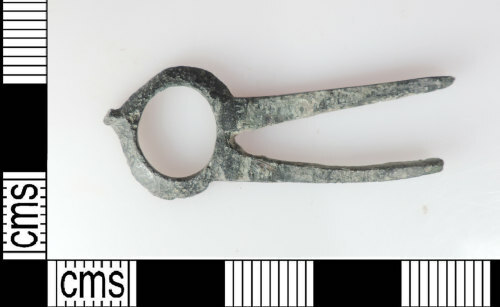 Medieval copper alloy buckle with integral forked spacer, 37mm long, 16mm wide and 2mm thick with a weight of 3.27grams. The object is rectangular in form and cross section and is the central part of a three part buckle with integral strap end. It consists of an oval shaped buckle frame which has tapered sloping outer edges. This is attached to two forked spacers with a rectangular cross section. These form a rectangular platform for a metal plate and each one tapers in width towards their end to accomodate the belt.